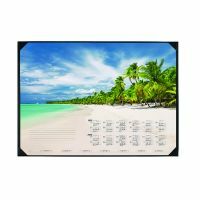 This Durable Tropical Beach Calendar Desk Mat has a non-slip base and comes with 25 sheets of feint ruled paper for neat notes. Each sheet also includes a 2 year calendar for quick reference. The sheets are glued at the bottom to help prevent creasing and can be easily removed when required. Refill pads are available separately. This desk mat features the Tropical Beach design and measures W590 x H420mm.